This quote is very true and absolutely applicable to your own “book” – a diary or journal – as well. 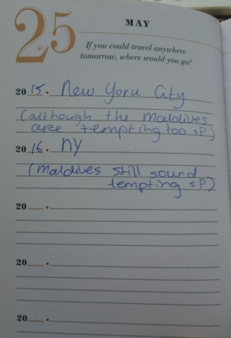 On the 5th of April 2015, I bought a 5 year Q&A diary published by Potter Style (USA). You have to answer a question everyday for five years. The question is the same for every date (see image below). It allows you to notice a shift in your answers or you can conclude that everything stayed exactly the same. The questions vary, sometimes you are asked what you wore that day and sometimes the questions are on how you want to be remembered or what your fears are etcetera. As I have already completed a year, I am now able to compare my answers of last year. Sometimes, this can be eye-opening and sometimes it reminds you of all the epic adventures you went on. A while ago I read some articles of inter alia De Groot (2013) and Hutterer & Liss (2006) on diaries, memory and neuroscience. These articles really resonated with me. It was claimed that the body can only feel psychological pain for a brief amount of time. However, as everyone probably knows, you can hurt for days, weeks, months or even years over something. It turns out, it is not the actual event that is causing you the pain, it is the memory of the event and the pain it caused. Your body does not know whether you are actually going through something, or that you are just remembering the event. Perhaps fortunately, the body is also tricky and is able to forget a lot of events on the conscious level. 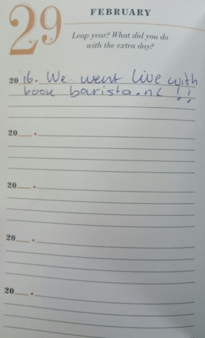 Therefore, keeping a diary can be tricky as well – you write it down and especially with a five year diary, you read it again and thus you are reminded of the event. 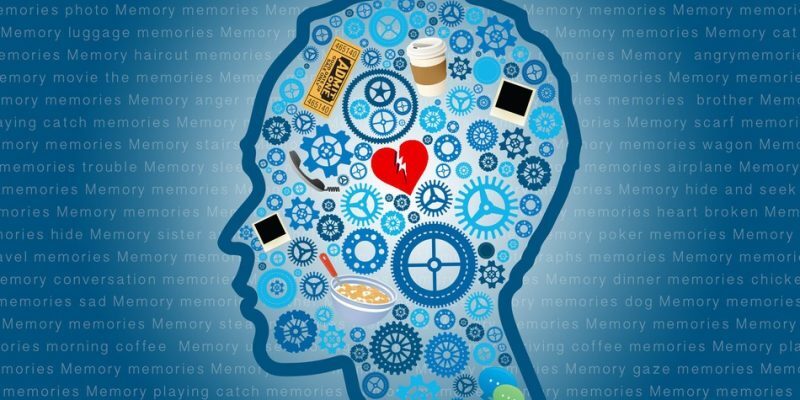 This can cause your memory to make you believe you are actually going through it again and in believing so, it can bring back the hurt (or of course the joy!). The flip side to this is that writing down experiences are likely to actually cause relief. It is very important to let out feelings of discomfort, hurt or whatever emotion you are feeling. It allows you to move on. However, in this Q&A diary you can only write a few sentences, so there is no space for elaborate explanations of complicated feelings. Moreover, it doesn’t only ask you about heartbreak, disappointments etcetera, it also reminds you of all the wonderful things that happened. Reliving these memories is actually joyful. So do I experience above theory while rereading? The answer is no. Personally, I try not to dwell on memories, nor when I read them, so to me it’s most of all interesting to read both the fun and less fun stuff (despite the fact that I am possibly the biggest dreamer alive). I do find the psychology behind memory fascinating though. To summarize, it appears that a diary can be more than just pages that you fill with your thoughts and in the end, rereading both hurtful and joyful events can trigger emotions but it’s up to you how you cope with that. Also, I am sure there is a lot written on diaries and memory that I have not read and perhaps offer a completely different perspective on this matter (as there always is in science). I am very eager to finish this Q&A diary, although it’s not necessary for time to go by extremely fast. I hope that my hopes, dreams and wishes will be fulfilled after these five years, albeit that a lot changes over the course of five years and so will I. Perhaps, my hopes, dreams and wishes will be completely different tomorrow, next month, next year or beyond that – time will tell. In my opinion, it’s incredibly interesting and fun to answer these questions and to notice change or sameness. 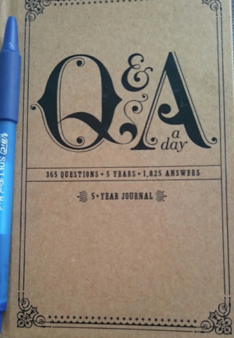 I would definitely recommend this Q&A diary to everyone! Interesting book. Nice to look back and notice the changes in your thinking/feeling. Eventually we still have have the same thoughts after many years, isn’t it? The question is: do we REALLY change our “mental model” when we have grown up?